Despite the limited number of ingredients, these easy-to-make stuffed mushrooms are boldly flavored. 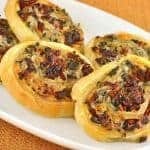 Filled with a simple combination of garlic-sautéed spinach and sun-dried tomatoes, then topped with Asiago cheese, they’re also lighter than most stuffed mushroom recipes and make a nice starter that won’t spoil anyone’s appetite for dinner. 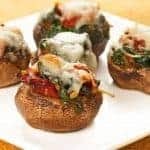 A tasty appetizer of bite-sized, baby portobellos (cremini) filled with sauteed spinach and sun dried tomatoes and topped with melted Asiago cheese. 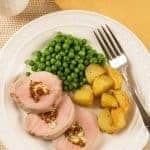 Preheat the oven to 375°F and coat a shallow baking sheet with nonstick spray. Arrange the mushroom caps on the prepared sheet and sprinkle with salt and pepper. Heat the olive oil in a skillet over medium-high heat. Add the garlic and sauté for 1 minute, then add the spinach. Sauté until wilted, tossing constantly with tongs, 2 minutes. 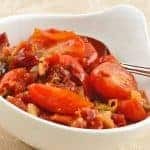 Remove the pan from the heat, season lightly with salt and pepper, then add the sun-dried tomatos and combine well. Allow to cool for a few minutes before proceeding. 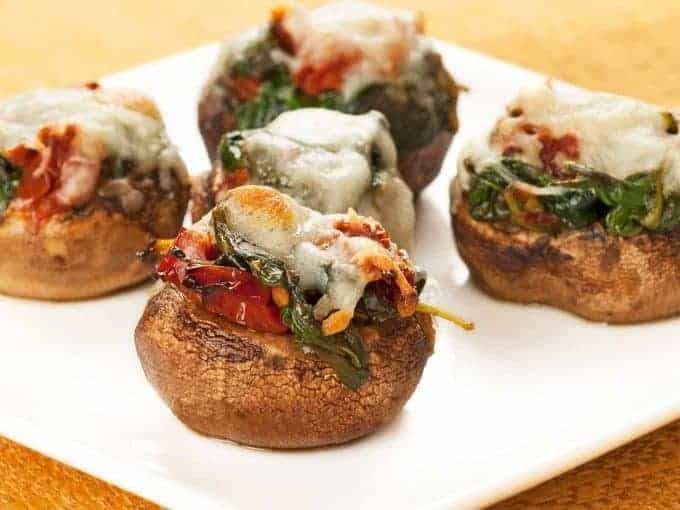 Using a small spoon (or your fingers), fill the mushroom caps with the spinach mixture, then top with each with cheese. 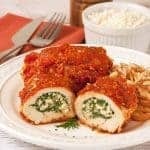 Bake for 8 to 10 minutes, or until the mushrooms are tender and the cheese is bubbly and lightly browned.